When someone uses the phrase, "You can't judge a book by its cover" it's usually to suggest you'll find more depth and complexity once you dig beneath the surface. But what about a cover that speaks of a "big creamy citrus hit", "mild funkiness", "a cocktail of yeasts", "local Chardonnay lees", homegrown grapefruit and "foraged wild plums"? 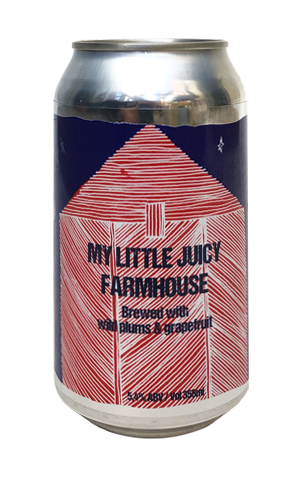 What could possibly be lurking within such a mélange of ingredients, for it is they that make up My Little Juicy Farmhouse from Sailors Grave? The best clue is perhaps in the last two words: Sailors Grave. For all that Gab and Chris like to plunder all that nature has to offer, they've tended to play with ingredients judiciously, releasing beers that are rarely much above 5 percent ABV and that work in subtleties rather than mouth-mangling. And this appears to be another case in point: the aromas are soft and (grape)fruity, the cloudy liquid is home to a juicy acidity – the prickle is more acid-derived than carbonation – and there's a tanginess underpinning things, but it's not one where you'll spend time picking the constituent pieces apart. So, I guess the phrase is apposite here too, it's just that what's inside is a simpler affair than the sleeve notes might suggest.